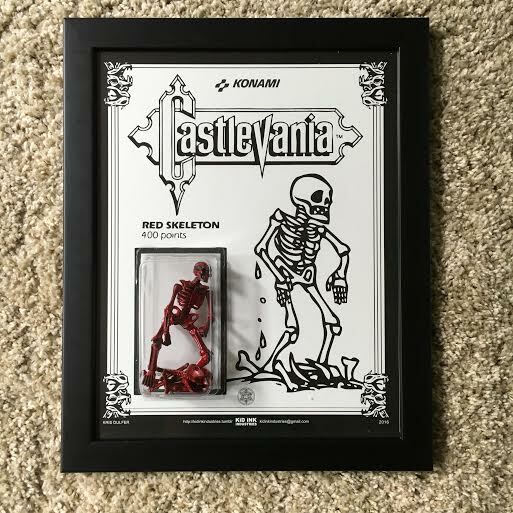 You've probably killed hundreds of them growing up on your path to destroying Dracula. And thanks to Kris Dulfer and his piece for the Arsenal of Artists show Game Over you can own one. 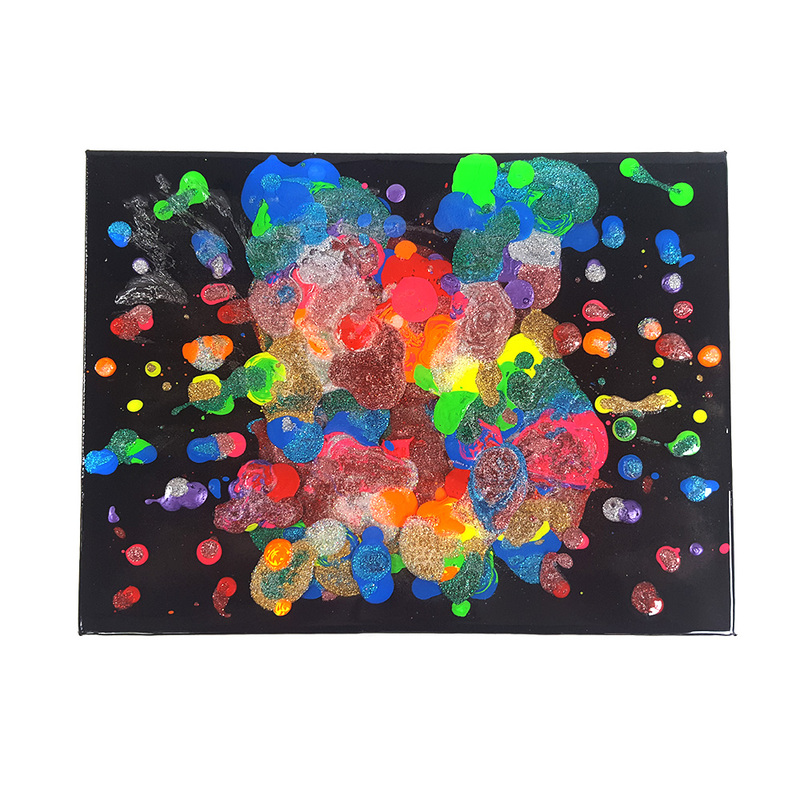 Kris crafted this from ink, abs plastics, resin, digital printing, cardstock, paints, adhesives all mounted on a 11x14 wood frame & lexan cardback to create a high quality collectible. This is a one-off; exclusive debut version for this show. It will be available today at the Game Over show at Cosmic Primate Tattoo in Hatboro, PA for $185.00. 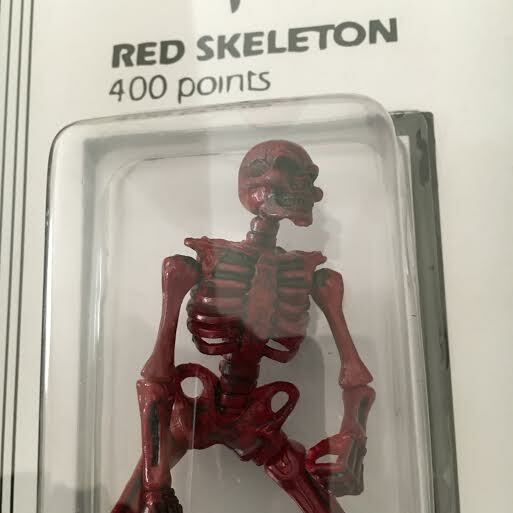 Head over there and add this high quality, unique and nostalgic piece to your collection today. You can find more of Kris' work at his Kid Ink Industries page. Arsenal of Artists presents Game Over, a group art tribute show to all things video games! From cheat codes to power gloves, from Atari 2600 to XboxOne, from Super Mario Bros to Overwatch! The show is being hosted by the great folks at Cosmic Primate Tattoo, 136 S York Rd, Hatboro, PA 19040 on August 20th, 2016 between 12pm - 9pm. There's door prizes, raffles, a gaming truck, classic consoles to play, amazing sponsors, food specials and drinks. Not to mention tons of amazing art work for sale! And the proceeds will be going to Children's Hospital of Philadelphia. 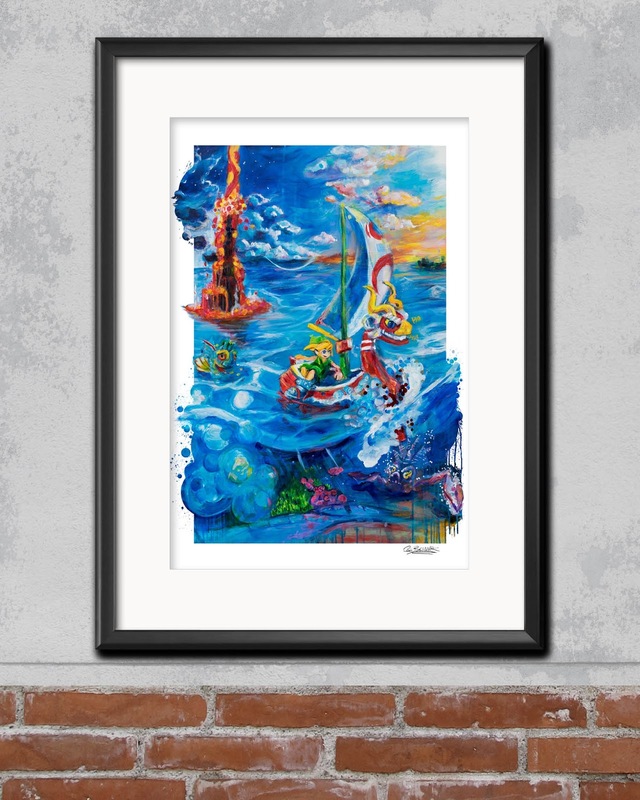 NEW Art Print Released from Superhero Nap Time artist Cole Brenner “Sail Away With Me” inspired after beating The Legend of Zelda the Wind Waker with his two year old son. The 13in x 19in print comes in Gloss and Metallic for $25. 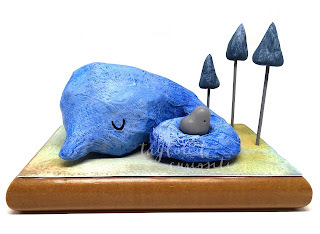 Just released on Etsy. Peak under the ocean from Legend of Zelda the Wind Waker. 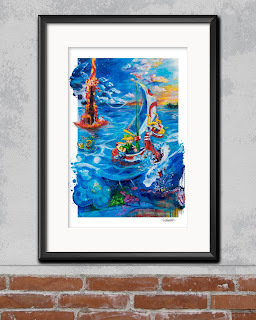 “Sail Away with Me” features Cole’s styling of the art edge. 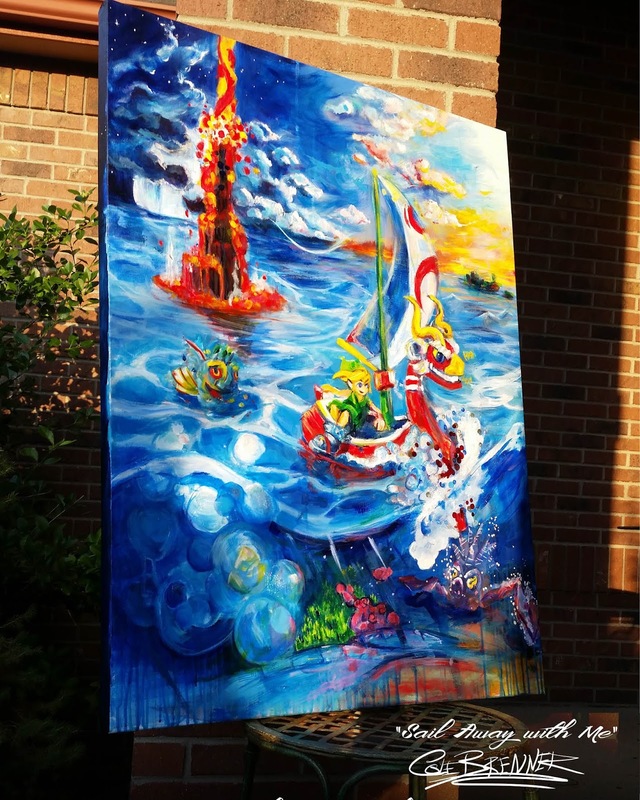 the art spills out into the white borders; the crest of the wave flows out across the white paper adding to feeling of the rolling ocean; The King of Red Lions sails through a wave as he laughs. Brenner felt this is how a moment in one day that followed Links adventure to defeat the evil Gannon. Big time Legend of Zelda fans, who have the Rupees to spend, can contact Cole through Etsy / FB / SuperheroNapTime.com for information on purchasing the original painting; currently on display in Denver’s Sol Shine Gallery (1501 Boulder St, Denver, CO 80211). Near Denver? Meet Brenner this Saturday 5-8pm for an Art Show at Sol Shine gallery & boutique...with free drinks! 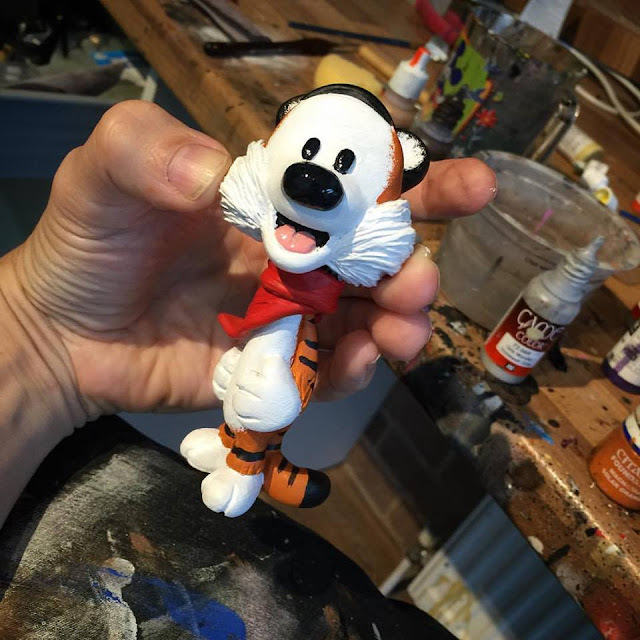 This was a commissioned piece sculpted by Rich Page, a UK artist aka UME Toys. You can't have this one, because it's got an owner already, but you can hit Rich up here to commission your own. Calvin & Hobbes is near and dear to my heart, as my father read it to me on Sunday mornings when I was a kid. An adorable 3D rendition of a beloved character which will forever live deep in my subconscious, child brain. Nice work, Rich. 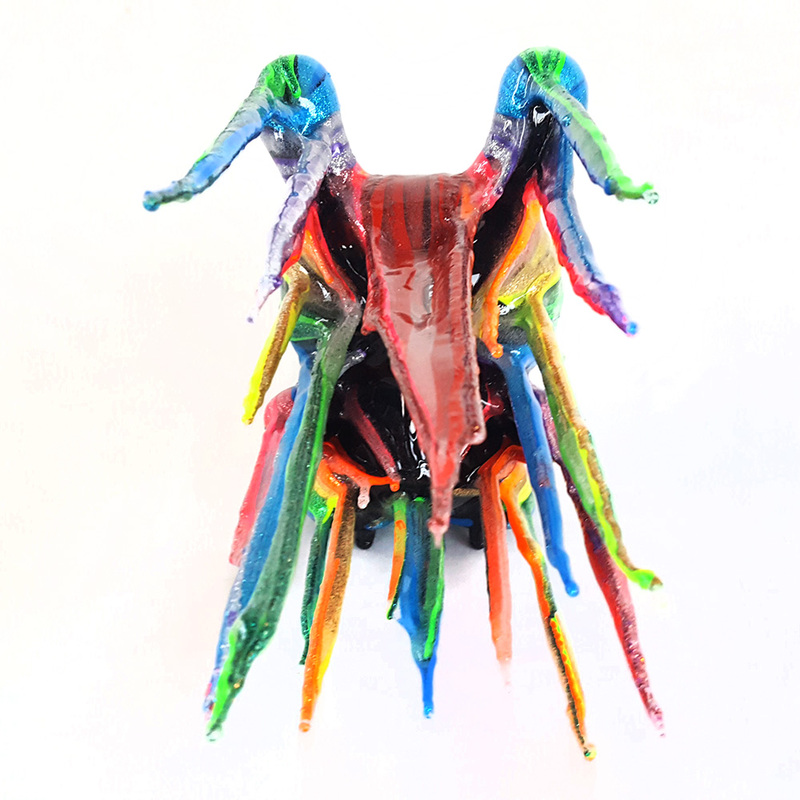 Not toys, of course, but completely insane and epic and worth a watch, especially with the Arsenal of Artists GameOver group show opening tomorrow in Philly! After a month of work I present to you Super Mario World In Dominoes! 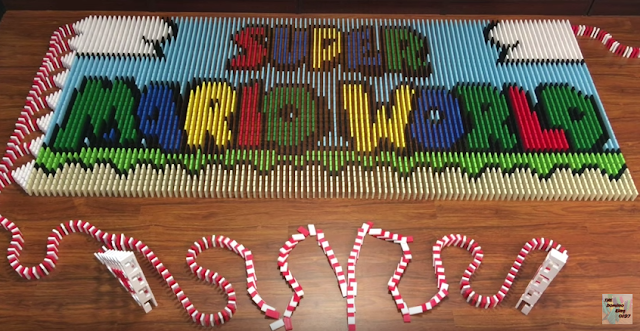 Super Mario World is my personal favorite Mario game of all time, and decided to recreate the game in dominoes. My original plan was to make a Mario Themed video with higher resolution pictures, but I didn’t have enough certain colored dominoes to make all the characters, so I ultimately decided on the classic 16-Bit of Super Mario World. Taylored Curiosities is back with two brand new creations. These miniature scenes are subconscious settings complete with removable houses, quirky trees and teeny Feelings. Choose from purple with a tiny Focus or blue with a tiny Calm. Both have a tiny Worry with them too. 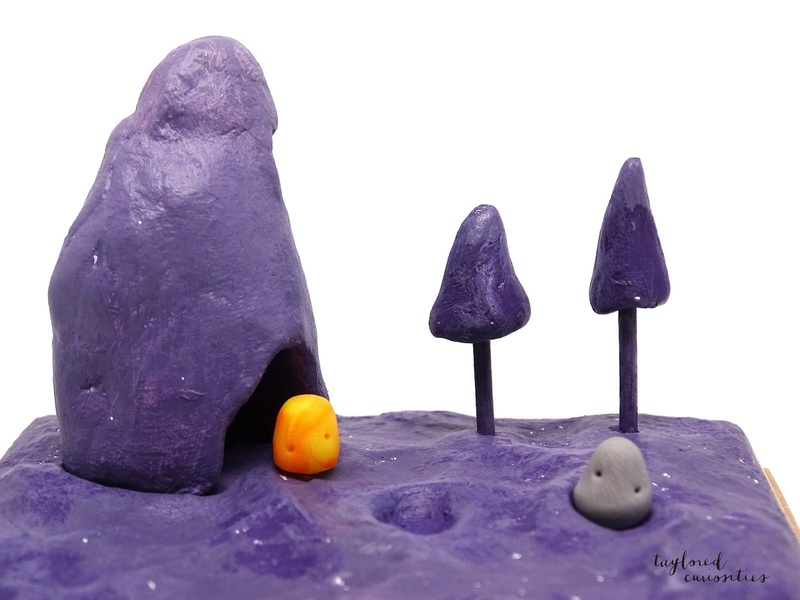 These are completely handmade by Taylored Curiosities. Bases measure 4" X 3" on each of these and they are available now for £25.00 for Subconscious Dwellings and £30.00 for An Anxiety Monster Slumbers. Incoming right now from Hong Kong is our shipment of Jesse Pinkman one sixth scale action figures by Three Zero. Preorder yours now for $150 right here, they should arrive in about a week. We ship international via your choice of courier. An incredible likeness of actor Aaron Paul from the smash hit show Breaking Bad, this detailed action figure features real cloth clothing, alternate hands, stacks of cash, a gun and various extra clothes and accessories. Worth the price for the 1/6 leather lacket and 1/6 sneakers alone! Josh Mayhem presents "Blown Back" - a custom 8" Dunny & 9"x11" canvas set. With this set Josh introduces a new 2D counterpart to his 3D wind swept aesthetic. 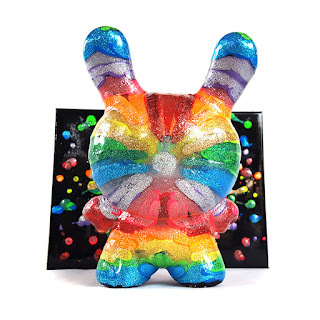 The canvas encases every drip of acrylic paint used to create the Dunny within multiple layers of resin. "Blown Back" will be available at Clutter Gallery's "Kaleidoscope of Kyoot" show. 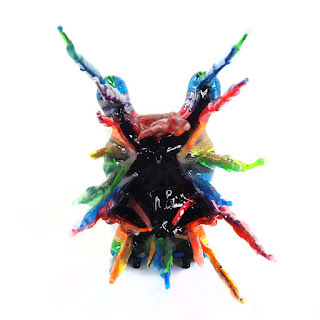 Make sure to sign up to Clutter's Preview List to get dibs on all of the pieces from the show!